Guava, a tropical fruit which is also known as peru is a delicious fruit. Guava is inexpensive and regarded as one of the superfoods which has numerous health and nutritional benefits. It is the season of guavas, so why not discuss about some health benefits of the wonder fruit? Guavas for example regulates blood pressure due to its potassium content which reverses the effects of sodium in the body. 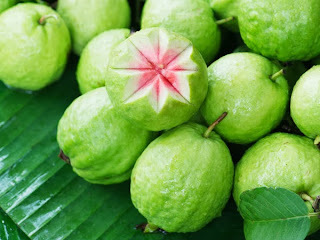 Guava benefits the health as it is rich in Vitamin C, an antioxidant which prevents cells from damage of free radicals. This in turn protects the body by lowering the risk of cancer. Other health benefits of guava are; it increases blood circulation in the body which improves brain functioning. Similarly, guavas are also considered to be very good for diabetics. Guavas if consumed without its skin can be a healthy fruit for diabetics. According to scientists in India, guava's skin increases blood sugar levels, so diabetics must consume it without its skin. It is one of the fruits that is healthy and nutritious for the diabetics. Consumption of guava reduces the absorption of sugar in the blood. This brings down high blood sugar levels in diabetics. Guavas are rich in dietary fiber which makes it a healthy and stomach-friendly fruit for diabetics. According to studies, guavas are rich in fiber which makes it effective for lowering the chances of developing Type 2 diabetes. Guavas are low in Glycemic Index which is why guavas can be consumed by diabetics. Guava leaves are very healthy as they prevent the chances of developing diabetes. Dry the guava leaves and crush them. Boil in hot water like tea to get all the essential ingredients from the leaves, and consume it. The leaves of guava can prevent diabetes, and reduce blood sugar levels among diabetics. Eating ripe guavas is good for diabetics as the fruit has complex sugars in i. Make sure you do not eat too much ripe guavas. The fiber in guava also helps treat constipation which is very commonly faced by diabetics.